May’s stamp of the month club is in honor of moms. 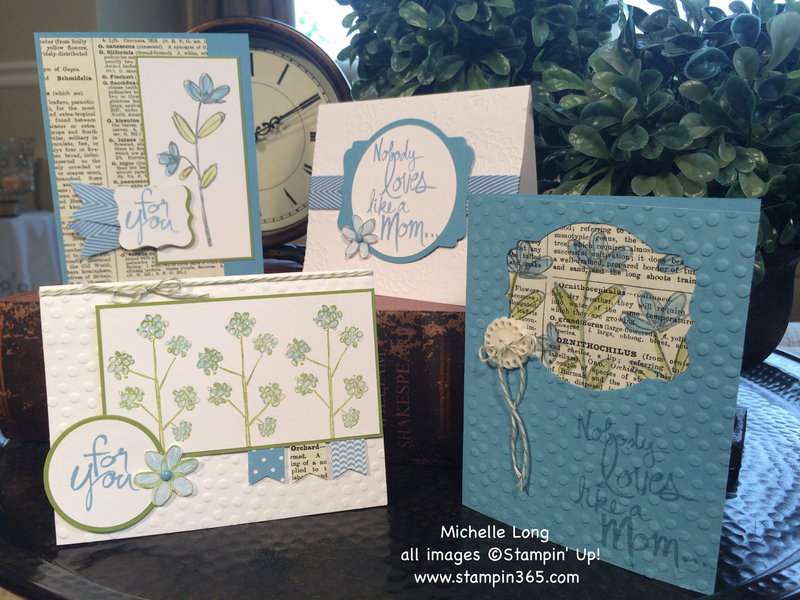 My own mom and my mother-in-law both love blue, so I choose the stamp set “Mother’s Love” and paired it with Marina Mist. Our stamp of the month club is just $34.95 and includes everything to make the four cards above, all precut and nicely packaged, along with envelopes, typed directions and the gorgeous “Mother’s Love” stamp set. Stamps, paper and embellishments in your mailbox= papercrafting bliss! You just add the ink! The great thing about this set is that it can be used for so much more than just Mother’s day. I have already found myself reaching for the “for you” stamp over and over and the two step flower stamps are just gorgeous! Would you like to know more about the Stamp of the Month Club? Click here for all the details. Do you want in on the fun? Email me by the 20th of April at stampin365@gmail.com to sign up! Posted in Stamp of the Month Club	| Tagged Stamp of the Month Club, Stampin' Up! That means so much- thank you! You bet, Sandra! That is no problem. I did worry about the Mother’s Love set not being a good fit for everyone, so I will be happy to exchange it for the Bravo set. Your mom loves it! But not as much as she loves you! !